يضمن فندق Toowong Inn & Suites الذي رمم في 2008 لزائريه قضاء وقت ممتع في هذه المدينة الخلابة سواء جاؤوا في رحلة عمل أو سياحة. يمكن من هنا للضيوف الاستمتاع بسهولة الوصول إلى كل ما تقدمه هذه المدينة النابضة بالحياة. يضفي محيط الفندق اللطيف وقربه من أكثر المعالم السياحية جذبًا سحرًا خاصًا على هذا الفندق. إن الخدمات الممتازة وحسن الضيافة العالي في Toowong Inn & Suites تجعل إقامتك تجربة لا تنسى. لضمان راحة ضيوفه، يقدم الفندق الخدمات التالية: واي فاي مجاني في جميع الغرف, خدمة التنظيف يوميًا, مرافق مخصصة لذوي الاحتياجات الخاصة, تسجيل وصول/خروج سريع, تخزين الأمتعة . 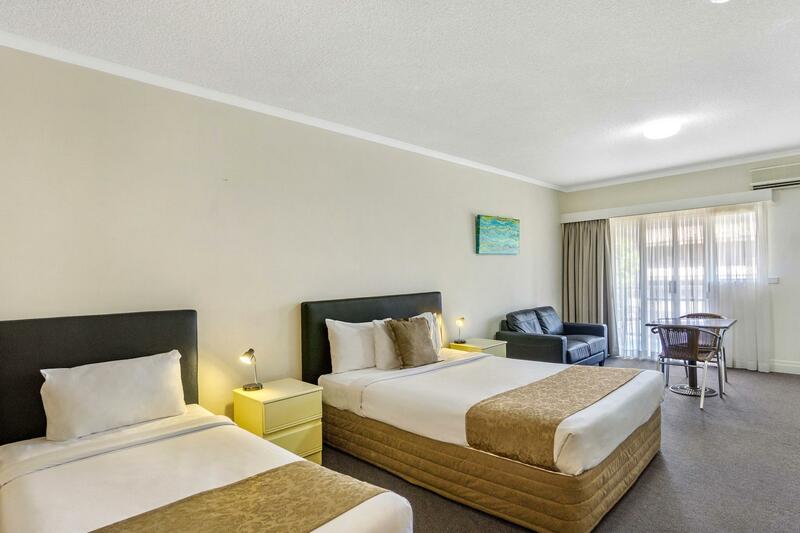 تنعكس أجواء Toowong Inn & Suites في غرف الضيوف.تلفزيون بشاشة مسطحة, قهوة فورية مجانية, شاي مجاني, بياضات, مناشف هي بعض الميزات الموجود في العديد من الغرف. صممت خدمات الاستجمام في الفندق والتي تتضمن حمام سباحة خارجي لمساعدتك على الاسترخاء والراحة. مهما كانت دواعي سفرك فإن Toowong Inn & Suites هو خيار ممتاز لإقامتك في المدينة. Super clean and tidy and amazingly friendly staff, will be our regular motel from now on. Good location and facilities. The King size and 2 single beds were very comfortable. Staffs was very friendly and helpful. The only fault is the weak wifi and limited used. If this can be sorted out, it will be even a better place for long stay. Great convenient position close to Toowong Village shops. Nice apartment for an overnight stay after arriving a Brisbane before heading go Gold Coast. Apartment is clean and kitchen well equipped. The kettle was a little wore out though, we used the pots to boil water instead. There is a street with reasonable choices of eateries and cafe round the corner. Overall a nice comfortable stay with ample space for car parking. Thank you for your positive comments and for advising us about the Electric Jug This has been replaced. Stayed many times. Great location. Easy for Suncorp games and to get to the city. Great value for money and would highly recommend. I had a wonderful stay in a king deluxe room and cannot speak highly enough on the quality of the room. It has everything you need and the room was incredibly quiet considering when I stayed the whole place was full. Would highly recommend. The only downside of this property was there was only one aircond in the room, it took a while to cool the whole big room and those who slept downstairs may feel warm in the summer. The property was good and very close to the Toowong Village shopping mall, it's very convenient. There are bus stops and Toowong train station in walking distance. The king and single beds were nice and comfortable. The pool was great so are the outside barbecue facilities and shower room. Sandra the receptionist was very friendly and helpful. Toowong shopping centre just a minute walk away. Will most definately recommend friends. I have stayed here several times, great location. However if I stayed again I would not choose a studio room. The bed in the room I stayed in was very uncomfortable..... so much so I left it during the night to sleep on the two seater lounge. On other occasions I've stayed in the business deluxe king room which was fantastic.....very comfortable bed.... That's what I'll be booking if I'm to stay here in the future. Very convenient, stay there all the time when in Brisbane, coffee shops and lots of eatery places to choose from. Don't need to drive as public transport is at your door step. Only down side lots of construction. I would recommend this place to stay in Brisbane. I very closely to the Toowong village that you can buy a many food here. The location is very convinient to Ferry at Ragetta, Train at Toowong and many Bus stops. Very comfortable, spacious suite. Very clean and well equipped. Staff very approachable and accommodating when request made for extra blanket etc. The motel has a lift, great if you don't handle stairs well, and plenty of free undercover car parking. Would stay again. Highly recommend. Convenient, short distance walk to Toowong village & eating places and a little more to the train. This is my second recent stay and this time I booked for friends also. The only negative at the moment is the noisy construction currently occurring next door from 6 a.m.... on a Saturday!! We realise this isn't the motels fault however be aware if you're not an early riser. Great location for train station, wouldn't hesitate to stay again.